Abnormal posture is becoming more and more prevalent; we are doing activities and jobs that our body’s were simply not designed to do. Sleeping on poorly designed or inadequately supported mattresses, long hours of sitting at desks, poorly designed seating, driving long distances and heavy manual jobs are all contributing to increased spinal stress. As a result, our spines, joints and body’s are suffering. Watch this short video on A Day in the Life of a Human Spine to get an idea of how our spines are affected from day to day. 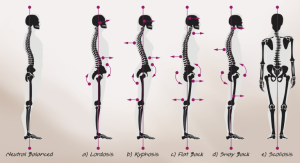 The image below demonstrates normal posture versus the most common abnormal postures. Image (A) depicts a hyperlordosis – an increase in the lower back (lumbar) curvature; Image (B) depicts hyperkyphosis – an increase in the upper back (thoracic) curvature; Image (C) depicts a flat spine – a loss of upper and lower spinal curvatures; Image (D) depicts sway back – a backwards shift of spinal position (mainly the shoulders) to compensate for increased lumbar curvature; Image (E) depicts scoliosis – a spine that has become curved in a sideways (lateral) direction. One of the most common spinal abnormalities in modern times is the hyperkyphotic posture. This results in an accentuation of the upper spinal curvature, flattening of the lower back curvature, hyperextension of the knees and a forward head carriage with rounded shoulders. Hyperkyphosis occurs when vertebra fall forward and the segments above have to follow suit. Eventually, as multiple vertebrae fall forwards with no way of moving themselves back, the spine becomes hyperkyphotic and the surrounding musculature become overstressed, dysfunctional and painful. As you can see from the image above, the upper back has an increase in its curve and the neck and head have fallen forwards. You can imagine how much more strain the muscles that sit around the head and neck are now under. Also, because your centre of gravity has now moved forward, the muscles around the low back, pelvis and legs have to work harder to hold your whole body up. Therefore, dysfunction and pain can occur from your toes to your head. The chest cavity is also compressed which results in excess pressure through the heart and lungs and increased workload. One of the most common causes of this abnormality in adolescents and young adults is technology, i.e. mobile phones, laptop/PC’s, tablets and games consoles, AKA tech neck. From a very early age, children are exposed to technology and are given use of such devices which result in long hours of looking down at them. When the head is under normal posture it weighs around 10-12 pounds, if the head is flexed to 30 degrees it weighs around 40 pounds and if the head is flexed at 45 degrees is now weighs around 49 pounds. The more the head is flexed forward the more pressure it applies through the neck, upper back and surrounding musculature. Looking down at your device can, therefore, more than triple the pressure through your neck and upper spine. There are many other causes of hyperkyphosis such as poorly designed workstations, couches that are too deep and too soft and sleeping with the wrong height of head support. The increase in thoracic kyphosis can be viewed as the normal ageing process, however, it’s not! 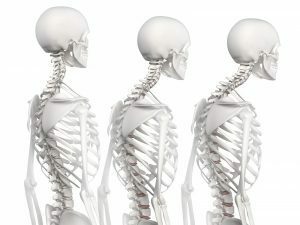 Hyperkyphosis was historically associated with decreased bone density and resultant vertebral wedge fractures, however, the research states that 70% of people with hyperkyphosis do not have vertebral wedge fractures. This postural abnormality is therefore treatable and reversible, as are most spinal abnormalities given enough time. If the cause of your postural problem is not due to a fracture, cancer or infection then ABC can help. Please visit the Advanced BioStructural Correction page for more information. These can occur due to increased gravitational pressure through the vertebrae leading to susceptibility of fracture over time. The way in which a vertebra is compressed is demonstrated in the way it fractures i.e. the front aspect of the vertebra collapses leaving the back aspect intact, leading to a wedge-shaped configuration (wedge fracture). Compression fractures most commonly occur in the upper part of the spine (thoracic spine) however they can generally occur anywhere in the spine. Once a vertebra has undergone a wedge fracture, the mechanical stress distribution is then altered and an increase in thoracic kyphosis can occur. Compression fractures can also be due to trauma, underlying bone diseases such as benign or malignant tumours, genetic bone weakness such as Osteogenesis Inperfecta or reduced bone density seen in osteopenia/osteoporosis. If you have experienced one or several compression fractures then it is important to have underlying disease ruled out via X-ray or MRI. The research states that approximately 70% of people with hyperkyphosis do not have wedge fractures. If there is no underlying disease then ABC can reduce adverse mechanical pressure in a way that will remove the susceptibility to further fractures. For more detailed information, please visit the Advanced BioStructural Correction page. Crawford and Jull, 1993; Balzini et al., 2003; Ryan and Fried, 1997; Cook, 2002; Kado et al., 2005; Hinman, 2004; Di Bari et al., 2004; Huang et al., 2006; Anderson and Cowan, 1976; Tager et al., 2003; Kado et al., 2004; Lynn et al., 1997.